There is a lot of suffrage-themed memes and pop columns online during this year of the centenary of votes for women, as well as left over from when the Suffragette movie came out a few years ago. Very little of it references any suffrage campaigning outside of London. Most of it is riddled with errors and inaccuracies. Almost none of it has been written by anyone with training in how to avoid hyperbole, teleology, or the application of anachronistic values. So what to do? Where do you go to find readable, enjoyable, well-researched pieces that talk about the very specific suffragette situation in Ireland? Relax! We have spent the year sorting wheat from chaff, and compiled a list of accessible sources below. Some are quick reads, some are longer, and some are just for browsing online during your coffee break at work. Opening page of the DWSA minute book. 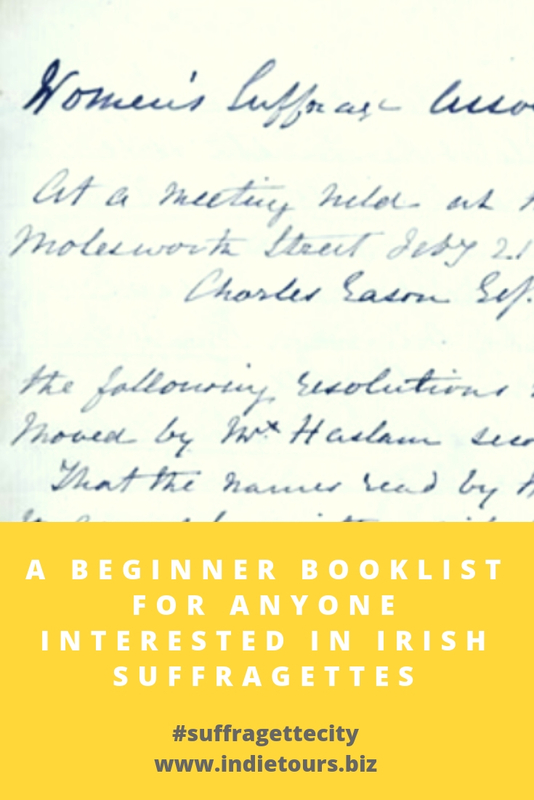 Most of these are in Irish libraries, and some are available in Google Preview so you can read a chapter or two online for free. Thanks to the general disregard and downplaying of the movement in the last century, some of these brilliant books are available to buy really cheaply online in places like eBay and AbeBooks. If you read only one, may we recommend our absolute favourite which is the new commemorative reprint (2018) of Becoming Citizens; it is a really diverse and incredible collection of perspectives. Crawford, Elizabeth. The Women’s Suffrage Movement in Britain and Ireland: A Regional Survey (Routledge, 2006). Cullen Owens, Rosemary. A Social History of Women in Ireland: 1870 - 1970 (Gill and Macmillan, 2005). Cullen Owens, Rosemary. Smashing Times: A History of the Irish Women’s Suffrage Movement, 1889 - 1922 (Attic Press, 1995). Hill, Myrtle. Women in Ireland: A Century of Change (Blackstaff, 2003). Kelly, Laura. Irish Women in Medicine, c.1880s - 1920s: Origins, Educations and Careers (Manchester University Press, 2012). MacPherson, J. Women and the Irish Nation: Gender, Culture and Irish Identity, 1890-1914 (Springer, 2012). Murphy, Cliona. The Women’s Suffrage Movement and Irish Society in the Early Twentieth Century (Temple University Press, 1989). Pankhurst, E. Sylvia. The Suffragette Movement: an Intimate Account of Persons and Ideals (Longmans, 1931). Ryan, Louise, and Ward, Margaret. Irish Women and the Vote: Becoming Citizens (Irish Academic Press, 2007). Sheehy Skeffington, Hanna. Reminiscences of an Irish Suffragette (Dublin, 1975). Ward, Margaret. Hanna Sheehy-Skeffington: A Life (Attic Press 1997). Ward, Margaret. Unmanageable Revolutionaries: Women and Irish Nationalism (Pluto Press, 1995). Watkins, Sarah-Beth. Ireland’s Suffragettes: The Women who Fought for the Vote (The History Press Ireland, 2014). The newspaper columns are written by many of the same women who produced the books above, and are perfect for a coffee-break length read. JSTOR also has upped their game in the last few years and made it possible for anyone to read three articles for free online instead of paying through the nose for each one! Kelly, Vivien. “Irish Suffragettes at the time of the Home Rule crisis”, in History Ireland, issue 1 (Spring 1996). O’Neill, Marie. “The Dublin Women’s Suffrage Association and Its Successors”, in Dublin Historical Record, Vol. 38, No. 4 (Sep., 1985), pp. 126-140. Ryan, Louise. “Read all about it: writing wrongs”, in The Irish Times, 17 October 2012. Luddy, Maria. “Separate but equal”, in The Irish Times, 17 October 2012. Quinlan, Carmel. “Standing up for women in politics”, in The Irish Times, 17 October 2012. Mulvihill, Mary. “An Irishwoman’s Diary”, in The Irish Times, 31 July 2000. All Irish Times articles on suffrage have also been helpfully grouped here. This is a great place to start to get a visual impression of the times. 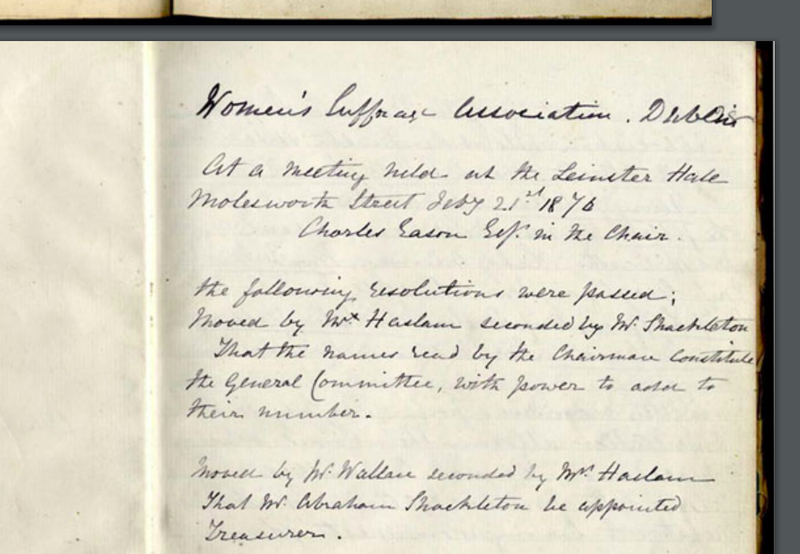 There’s nothing better than digging around the pages of the original minute book of the Dublin Women’s Suffrage Association in the late nineteenth century. You wouldn’t be here if you didn’t think so too! The DWSA minute book, digitised. RTE film and associated audio/ images. Dublin City Library’s gallery of images from the time. Discovering Women in Irish History - an online resource of text and images from the Dept of Education. If you have any to add, please leave a comment! You can also read all our previous blog posts about different aspects of the suffragette movement in Ireland by clicking here. Sign up with your email address to receive weekly newsletters with behind-the-scenes info on how the #SuffragetteCity project is developing.